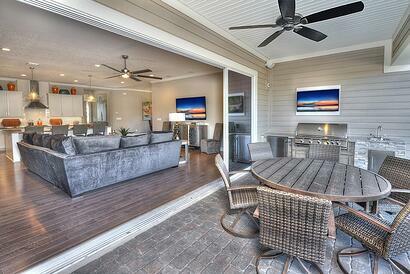 Gone are the days when “outdoor living” meant throwing a few folding chairs in the back yard. Instead, today’s homeowners seek creative, attractive outdoor spaces that extend their home’s indoor living area. Heightened flavor, easy clean-up, and extra living space... what's not to love? Outdoor kitchens are gaining momentum as one of the most popular facets of new home design. The National Association of Home Builders, in fact, has identified outdoor kitchens as one of its “Hot Housing Trends." In addition, one NAHB study found that outdoor kitchens add 130 percent of their cost to a home’s value. It's no secret that Florida heats up quite a bit in the summer months, which sometimes equates to higher energy bills. In the middle of preparing dinner, you may notice that all of the warmth from cooking cranks up the A/C. According to ICI Homes, summer kitchens can lower high energy bills by removing that additional heat from your home by taking it outside. As it turns out, not only are summer kitchens pragmatic, they are a wise home investment. Outdoor firepits and fireplaces are becoming common backyard staple pieces in new homes. When pondering the idea of a "backyard fire", our minds often wander to a camp fire and the rustic, flannel vibes that accompany. However, fire-pits have the innate ability to transcend any space, no matter the style choice. Fireplaces also come in many shapes and sizes. For a craftsman touch, a stone fireplace can make a space complete. In a more elegant setting, sleek gas fireplaces provide a poised statement piece. Both fireplaces and fire pits allow for fun flexibility in creating your outdoor oasis. Fire pits, and fireplaces alike, are a great way to get those you love gathered around together, distracted from technology, and enjoying the tranquility of the outdoors. Look for more new homes to blur the lines between inside and outside this year. In the Nocatee community, for example, many of the builders offer homes with pocket sliding doors that recede into the wall, seamlessly blending the home’s great room with an outdoor covered lanai to create one large indoor/outdoor area for entertaining. The addition of sliding glass doors in the master suite also provides home-owners with the option of welcoming in the breeze and waking up to a view. The glass option allows owners the ability to close off harsh weather without sacrificing warm natural light. The increased visibility and light grants openness making your home feel much larger than its actual square footage. “Master-planned communities are a great place to find new homes featuring the latest design trends,” notes Richard Ray, managing partner of The PARC Group, Nocatee's developer. 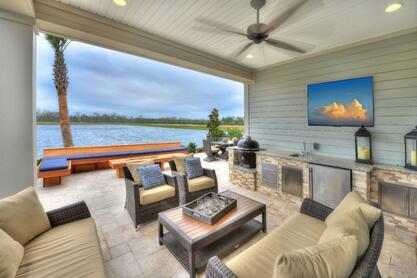 “Master-planned communities tend to have multiple builders who stay on top of what home buyers are looking for in their new home -- and in our case, Nocatee’s beautiful year-round weather really lends itself to the outdoor living trend." Be sure to find us on Pinterest to find other ways to spruce up your home for warmer weather!